Welcome to DWELL Residential Brokerage – a modern, fresh approach to real estate. 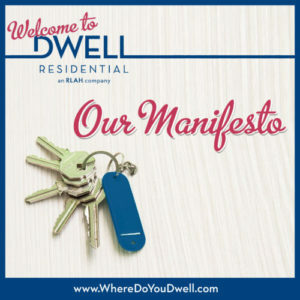 Here at DWELL, we believe that real estate is an important financial tool to help you get from where you are­ to where you want to be, literally. Real estate has the power to create so much. Think about it—where you live defines the type of life you live in so many ways. It can affect how you feel, the length of your commute, who you spend time with, what you spend time doing, the amount of time you can spend socializing not to mention your entire financial world. We want you to see the possibility, live your dream life and understand how real estate can make it all happen…..
Perhaps you’ve gotten stuck in a rut or have forgotten about those dreams you had as a child. We want to reignite the spark to DREAM BIG and then help you get to where you’re going. Do you drive through a certain neighborhood on your way to work and think it’s out of your reach? Have you resigned yourself to the fact that you will have a SUPER long commute and there’s nothing you can do about it? Do you feel like it’s all just out of reach? You just have to open up yourself, your mind, and your heart to all of the things that you really want out of life. You’re probably saying: “OK – how do I do that?” Keep reading. To most people real estate means price range, home type, and location. We’ve flipped this old mindset on its head. To us, real estate begins with the most important piece – YOU! What’s your true lifestyle? Are you a home body? Do you love having people over? Are you out every night walking or biking to the nearest new hot spot? Do you work late and need to be close to the office or a quick commute. What is your actual reality? Where and when do you feel most happy, thrilled, engaged? How important is a car and parking space to you? Dream of a car-free life where you can walk or bike everywhere? Or, does driving into your very own parking spot get your engines revved? Do you like to garden and enjoy quiet, outside space when you come home? Would you prefer to commute to get more space or do you want to live in the middle of the city? Would you prefer to live in a small home so you have the funds to travel the world or for a favorite hobby? Do you want a place large enough to entertain all your friends and family? Your answers to these types of questions (and we have a lot more to ask you) are life-changers, life determiners, and real estate is the gateway. At this point you might be saying – this sounds expensive. Not so my friend. DWELLing in possibility does not mean getting in over your head or being house poor. Once we get down to the TRUTH about what you want we’ll show you how to meet your budget and still make it a home and location that is perfect for you and what you’re all about. One of the absolute best ways we can help you save money is through homeownership assistance programs for first-time buyers and for those with moderate incomes. You’d be amazed to see what is out there for the taking in DC, Maryland, and Virginia! Many state and local governments (DC, Arlington County, Alexandria, Montgomery County) offer programs that can ease the cost of your home purchase. Even banks and other lenders have programs or grants to help buyers so you’re not wiped out financially. Each program varies on how you save money. It can come down to help with your down payment or closing costs, a tax credit, an outright grant, or eliminating the dreaded PMI (Private Mortgage Insurance). But, it all adds up to more money in your pocket, rather than in your home, and you still have the home you dreamed about! Turn up your Speakers (or pop in those ear buds) and listen to Jenn’s Radio Interview discussing more ways to save BIG! It will probably be the biggest purchase of your life. Don’t get us wrong, it’s a serious transaction and there’s a good chance you’ll feel a little scared along the way. Mark Twain once said, “ Courage is resistance to fear, mastery of fear, not absence of fear”. When you feel scared it means you are outside of your comfort zone, and in this case, maybe that’s a good thing. Buying a home, putting down roots and making it your own will bring you much more joy than anything else, not to mention the tax benefits. That check in your pocket every year is something to be excited about! We are not here to sell you a house. We are here to HELP you find a HOME. We’re on your timetable and will never rush you. We won’t go anywhere and will keep working with you until we know you are pleased with the end result. Buying your first home is a large financial investment and is essentially the stepping stone to your next home, so we’re committed to helping you make it right the first time. Potential. You’ve got it and so does your future home. Our job is to help you see it. We are real estate experts and LOVE nothing more than uncovering the hidden potential of a property. Your dream home exists and sometimes all it takes is a little imagination….and elbow grease. We can point out quick, easy and FUN ways to make your dream home a reality. We do this all the time with our own home purchases and we can show you how easy and inexpensive it can be. We’ve also got great partners that can turn any town home, condo or single-family house into a home AND keep it humming for years to come. After all, it is more about YOU making your DWELLing into YOUR home. Maya Angelou said it best – “I long, as does every human being, to be at home wherever I find myself”. We understand what it’s like to be a first-time buyer or seller and are excited to start the journey with you. We’ll listen to you, answer your questions, provide our insight, throw in some humor … and together, we’ll chart the best path to take. And if you’re not a “first-timer,” your concerns, wishes, and ideas will get the respect they deserve. We’ll help you sort through what you really want and make this real estate experience the best yet. 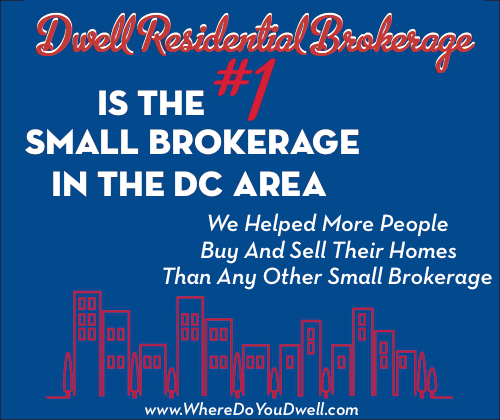 We know the local DC metro market and mean business when it comes to making each transaction, negotiation, and closing go more smoothly. But we never forget we’re dream makers too. We truly believe we can make your real estate experience an enjoyable journey that will change your life for the better. Our founder, Jennifer Myers, an award-winning real estate agent with over 10 years of experience, is excited to share this philosophy by opening DWELL and selecting a top-notch team of agents that will help carry on her mission. We’re thrilled to be located in DC’s trendsetting H Street corridor. Our convenient location lets us handle residential sales, leasing, and property management in the District, Virginia, and Maryland. DWELL in your potential – Let us show you how!